Fans of HBO’s Game of Thrones have had to wait well over a year for the eighth and final season to arrive. Now, winter’s return has been teased in a newly released promo from HBO. Within the new video, the wolf and the dragon of the Stark and Targaryen families are consumed by ice. 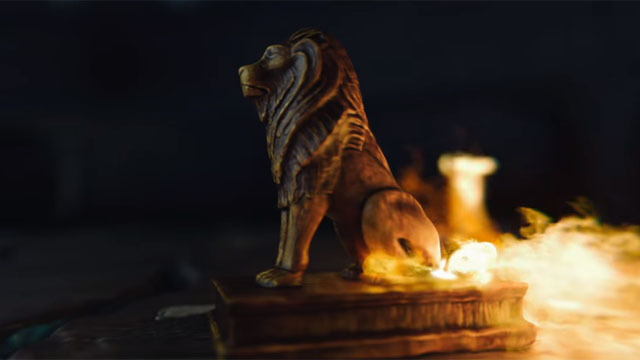 However, the Lannister lion is overtaken by flames, before the fire and the ice collide with each other. George R.R. Martin called his saga “A Song of Ice and Fire” for a reason, and we’re finally arriving at the endgame. The trailer’s ice imagery stems from the Night King and his army of the dead. White Walkers may be the only thing that can unite the living, but even the combined forces of the remaining armies can only do so much. Cersei merely pretended to send her forces to help, in the hope that she could remain in power and outlast her foes. Unfortunately, there may be no winners in this game. And if the flames are any indication, Cersei may have her own problems to deal with. It’s also possible that the flames represent the Lord of Light, one of the few deities in this world who seemingly has real power. Jon Snow’s resurrection was powered by the Lord of Light, which may mean he’s the equivalent of a fire wight. If Jon emerges as one of the victors, his survival and possible ascension to the throne could almost be viewed as a miraculous event. But if we’ve learned anything from Martin’s stories, it’s that he rarely takes the easy path. David Benioff and D. B. Weiss are adapting Martin’s ending before it’s even been published, which will surely rile up some of his longtime fans. Regardless of how it plays out, we’re eager for some closure. Game of Thrones season 8 will premiere in April 2019. You can watch the promo below, and the leave a comment to let us know what you think about it!